When it comes to shocks and struts, many of the most neglected vehicles are SUVs and pickups. By the time the shocks or struts are worn out, the driver has gotten accustomed to the poor ride and lack of control. In some cases, the problem is not addressed until a spring has broken or a shaft has snapped. Trucks need fully functioning shocks and struts because these vehicles have a higher center of gravity. A high center of gravity means that the ride control components have to control the low-frequency movements (engineering name for body roll). Low-frequency movements can be simulated using the knee-on-the-bumper test. If the springs, shocks and struts can’t control body movement and weight transfer, braking distances become longer and handling is compromised. When a panic situation arises where maximum braking and cornering capabilities are required, worn components can result in a crash. Shocks and struts wear out because of the rapid movements of compression and rebound, but that is only part of the story. Wear between the piston and tube allows fluid to bypass, but it is rare because other types of wear can appear before the bypassing of the fluid occurs. 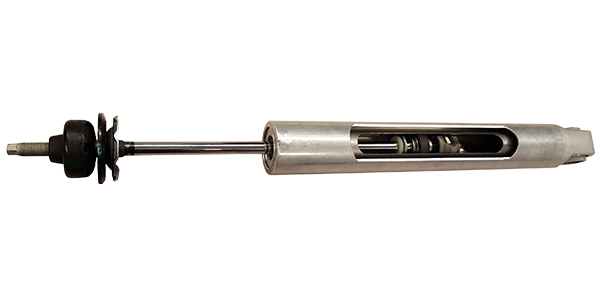 Over the life of a shock or strut, some of the oil will escape out of the seal on the shaft at the top of the body. If the finish of the rod or the seal is damaged by road debris, the leak will become worse. When the fluid is low, the shock or strut can’t control low- or high-frequency movements. Exposing the top of the strut to inspect for leaking oil is critical. This may require lifting the boot. The gas inside the shock can escape into the oil and out of the seal. Nitrogen gas is contained in a chamber at the bottom of the strut or shock, or in small bags in the case of some twin tubes. The gas is there to prevent the oil from cavitating and foaming when it is passing through the valves. Foam does not control the compression and rebound for the suspension or the oil. This causes a condition known as fade and can lead to loss of control. During a visual inspection, it is difficult to see the results of the loss of the gas charge. It is not until the unit is off the vehicle that you notice the rod will not extend after it is compressed. What makes a shock or strut “active?” For a shock or strut to be active, it must be able to react to three critical streams of information. First, it must act on information from the ABS and stability control system. Second, it must measure body movement. Third, it must detect the extent and rate of suspension movement. With these three pieces of information, the suspension can actively adjust the compression and rebound of the shock or strut. Why would an engineer or automaker include this feature on a vehicle? It’s because an active dampener allows for a ride without compromise. The three inputs can be used to detect a rough road or an emergency where body roll could change the stability of the vehicle. 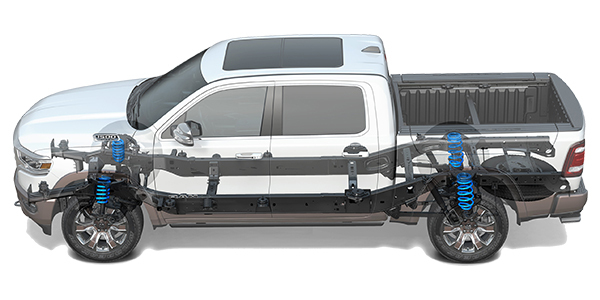 Many late-model SUVs and pickups have active shocks and struts that are integrated into the stability control system. 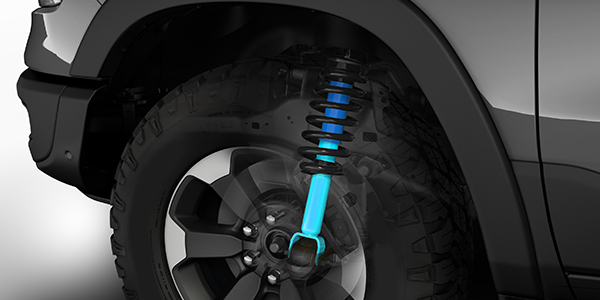 Electronically adjustable shocks and struts use conventional mono-tube and twin-tube oil-filled dampeners. The rods, gas chambers and piston have the construction of passive units. So, like a passive unit, they can fail if they leak and the gas or fluid escapes. One advantage of these active units is that they have codes. If a problem is detected with the system, the valves go into a fail-safe position that is fixed, and the system becomes passive. The driver is then alerted to the problem with a message or light on the instrument cluster or message center. Most systems will perform a circuit check when the system wakes up. This typically involves sending a signal to fully open and close the valve. If the system detects an open, short or a voltage outside of the specifications, it will set a code. Ride height sensors measure the position of the suspension and also the rate of movement. The data from the sensor is used to measure the movement of the suspension. By knowing how far and fast the suspension is moving, the module can use the information to determine the size of the orifice in the dampener to control compression and rebound. Active ride control offers more service opportunities than passive ride control. Beyond wearing out just like any shock or strut, there are also opportunities as the sensor, modules and actuators fail. 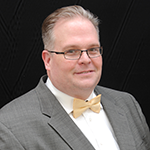 There are options for some more cost-conscious consumers where the vehicle’s resell value might not justify the replacement of a failed unit. Some parts suppliers offer passive conversion kits that have conventional valving. Some kits have ways to bypass the sensor, actuators and modules, so customers are not given a warning on the dash every time they start the vehicle.